We've gotten our first review of the new issue of The Martian Wave, and it was a positive one. Have a look http://www.drivethrufiction.com/product_reviews.php?products_id=117289. 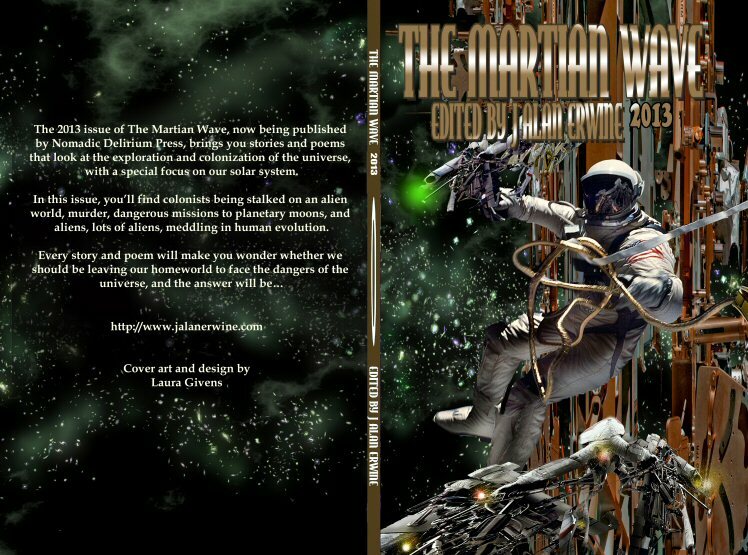 The e-book version of the 2013 issue of The Martian Wave is now available through Smashwords. You can get it at https://www.smashwords.com/books/view/340361. DriveThruRPG and DriveThruFiction are both running Christmas in July sales, allowing you to get all of the Nomadic Delirium Press titles for 25% off. You can order the RPG titles, which include all of the Ephemeris titles, as well as The Battle for Turtle Island by going to http://rpg.drivethrustuff.com/rpg_xmas_in_july.php?manufacturers_id=2805&filters=0_0_0_0_0_31815#selectpub, and you can get any of NDP's fiction titles by going to http://www.drivethrufiction.com/dtf_xmas_in_july.php?manufacturers_id=2805&filters=0_0_0_0_0_44595#selectpub. After a lot of plotting and planning, I've finally started actually writing my new novel today. I even managed to get 1000 words written. Yes, this was during the little one's nap. That might be my only writing time for a while. I've mentioned in a few places that people will be surprised by this one, and yes, I think they will be. I'm actually writing a...wait for it...a YA science fiction novel. Given how dark, and sometimes twisted my work usually is, this is a very big departure for me. Considering that I'm now working full time, and taking care of the little one a lot, this novel will probably take a while to write, but hopefully it will be a fun adventure. We're a week into the new month, and this is my first post of the month. The "real" job has been keeping me really busy, and leaving me quite exhausted, so I haven't had as much time as I want for the important things in life. 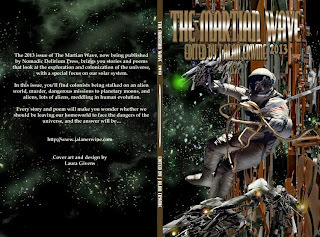 In important news, I've finished the formatting of the 2013 issue of The Martian Wave, and it should be off to the printer in the next couple of days. I've also been doing some mental outlining for the next novel, which will be quite a departure for me. I think people will be surprised when they find out what I'm working on. Other than that, there hasn't been much going on... just trying to get work done, and spend some summer hours with the kids before they go back to school...which will be here very soon.